Fog makes a lot of activities hazardous. We will here describe a few examples on how measurement of visibility increases the safety in different cases. 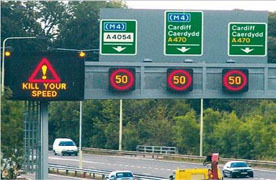 Visibility measurement is often a part of a road weather system RWS. The information is for example used for warning trafficants and for setting speed limits in order to reduce the risk for accidents. The optimal light intensity of the LED's in a variable traffic sign varies with the light conditions but also with the visibility. During foggy conditions - at night time as well as daytime - the intensity should be increased when fog is present in order to make them more visible. The fog detecting can be done using a visibility sensor like our OFS or MiniOFS. In foggy conditions at daytime the safety can be increased by turning the street lighting on. The trafficants will then get information that they will not get otherwise like an indication of the visibility by counting how many lamps that can be seen and also the location of the road side and the road. Therefore visibility sensors are sometimes installed at helicopter landing pads. Then landing will only be permitted if the visibility is better than a certain value. At big airports the visibility is measured regularly since start and landing in poor visibility conditions is much more complicated than at good visibility conditions (or forbidden). 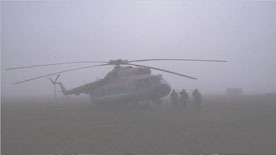 In earlier years fog was considered as a major risk factor for all sea transports. Today when radar is almost standard the problems because of fog at open sea are small.